If I could just walk into a concert like it was a five-star restaurant and order my favorite gourmet comfort funk, I would get the New Mastersounds with a Kung Fu starter. And Seattle got the finest made-for-pleasure funk available at Neptune Theatre last Thursday night. Connecticut funk group Kung Fu earned at least a hundred new instant fans with an opening performance that could have stood on its own as a complete show. 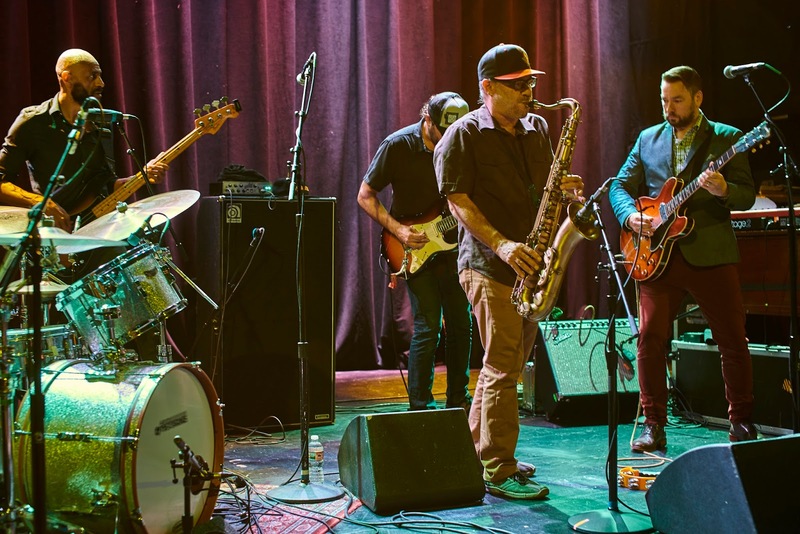 Dressed like a bunch of friendly neighborhood mechanics, Kung Fu’s joyride set utilized a base of old-school funk with thick modern electro-fusion layers on top. Robert Somerville’s saxophone (and well-placed vocals) tied it all together and kept even the lukewarm funk fans engaged. 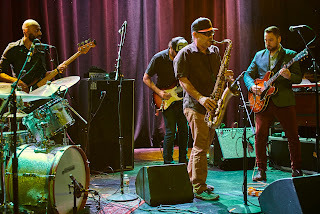 Kung Fu’s last few visits to Seattle have been at smaller venues, and at Neptune they proved their ability to morph into whatever version of themselves is needed for that particular room. Thursday night’s version of Kung Fu gets Seattle’s highest stamp of approval. Not surprisingly, Thursday was another rainy night in Seattle. Neptune Theatre is a beautiful old mid-sized venue with just the right floor space for a dancing crowd. It took a few songs into Kung Fu’s set before the audience could really be described as a “crowd,” and the room’s sound improved in quality with each body that filed in. As many live music fans know, these rainy nights during the workweek can be a blessing: the venue is not overly crowded, but filled with happy people immersed in the experience; there are no elbows in your face or ribs; no loud, distracting off-topic conversations nearby. All eyes and ears are on the music. After a brief intermission, before the concert goers had really even caught their breath, the four-piece New Mastersounds came out and launched right into their continuous series of funk masterpieces. In fact, the evening’s setlist felt a bit like a funk symphony: each song was a distinct movement yet generally flowed together seamlessly. This was my first time seeing this band, and I lost my mind for the first two songs until I remembered where I was and that this was in fact real life. Eddie Roberts’ guitar-playing is a definite highlight, switching effortlessly from sing-song melodies to expert rhythmic chords. But in no way does Roberts steal the show. 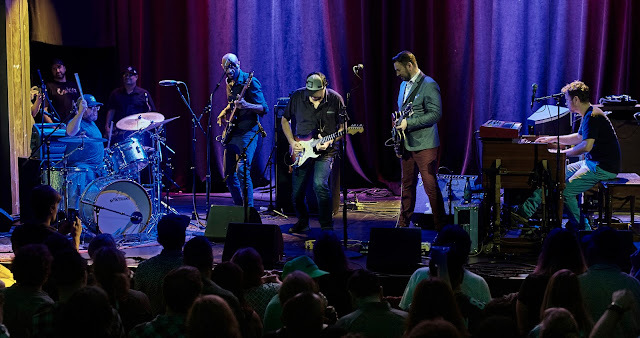 The band has an enviable balance between the instruments (and they all contribute to the occasional vocals), and each bandmate (Simon Allen on drums, Pete Shand on bass, and Joe Tatton on keys) is hyper aware of his fit into each particular phrase. They exhibit an incredible knack for matching each other's tempo, feel, tone, and volume instantaneously. The collection of songs (chosen on the fly based largely on the audience’s vibes) were mostly pure funk, and it was hard to believe this level of funk mastery could be from England. The band commanded the attention of the crowd with subtle flourishes, like a few time signature changes, quick turnarounds in tempo, and moments of mesmerizing jams that may have spoiled this particular funk fan for life. Towards the end of the New Mastersounds’ set, they brought members of Kung Fu up for a performance of “Windjammer.” The blend worked well, with Roberts and Kung Fu’s Tim Palmieri trading guitar licks and Adrian Tramontano looking right at home on drums for the larger group. The encore took a slightly slower, sexier turn for a minute, reminding the audience for the umpteenth time that the “masters” in New Mastersounds is no coincidence. In a town that never lacks high quality music, it can be difficult to impress Seattleites. This pair of bands did not even break a sweat getting us moving and smiling all night. Many thanks to the New Mastersounds and Kung Fu for coming way out west, and we look forward to many return visits.